Applications: These fit commonly available DA sanders with 5/16"UNF thread fixings. They are for grip backed sanding discs. We stock economic pads for both 125mm and 150mm sanders and also a 150mm pad with interchangeable fixing to suit the Festool fixing system. 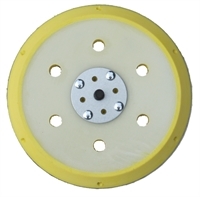 Product Notes: Suitable for sanding discs with or without dust extraction holes. Festool compatible fitment and M8 bolt included in part no AB.DA.6.150x5/16UNF+M8.A. Max speed rating on both sizes: 10,000rpm. Also Available: We stock a wide range of 125mm and 150mm grip backed discs, with and without extraction holes in grades from 40 up to 320.